#1. The publishers of Life's Little Instructions have heard that (your choice of novel) contains lots of great lessons for life, and they need your help to compile a special edition of instructions based on the novel! Suggest 20 different instructions that could be included in this edition. Instructions can be serious or light-hearted. Be sure to explain why each instruction would be appropriate. If you want to put the tips together into an actual booklet of some sort, you may put the explanations on the back of each page. #2. As you are reading (your choice of literary work), think about which (canto, scene, chapter, etc.) you want to illustrate. Then, illustrate the (canto, scene, chapter, etc.) or some aspect of it on 8.5x11 paper. You may use any type of images you deem appropriate—drawn, cut out, downloaded, three-dimensional, color, black and white, etc. Your goal is to depict the (canto, scene, chapter, etc.). Think not only about what is happening in the text, but also about the characters, themes, symbols, etc. On the back of your illustration, you must quote the one line from the (canto, scene, chapter, etc.) that best captures the essence of your illustration. Finally, you must attach a one-page explanation of why you have chosen to depict the (canto, scene, chapter, etc.) they way you have: Why did you choose the types of images you chose? Why did you arrange them the way you did? What does you illustration say about the (canto, scene, chapter, etc.)? This assignment provides an opportunity for students to think about all aspects of the literature and to create their own symbolism. Here are two student examples from Dante's Inferno. 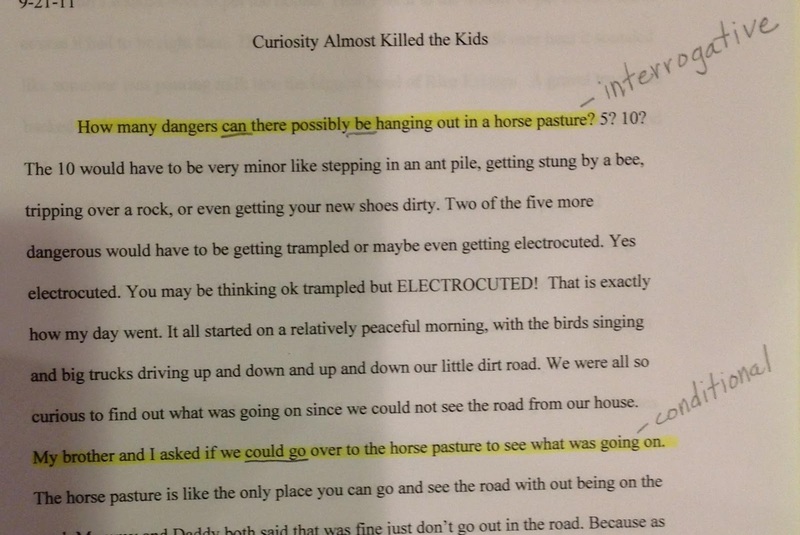 The written explanation gives this assignment real depth of meaning. #3. Choose five characters from (novel of your choice), and then choose something nonhuman to represent each one. (It doesn’t have to be something from the book. It could be something as random as a stapler.) For each character, write a paragraph that tells what object you’ve chosen and how that object and that character are alike. Specific quotations and/or paraphrases from the novel would be helpful in providing your explanations. I don't have a picture to share for this one, but it gives students an opportunity to really delve into the characters and think on a higher level. #4. Then saw you not his face . . . book? What if (insert author here) had known about Facebook?! We’ll each choose a character from (your choice of play) and make a Facebook page for him or her. Don’t forget a picture! Then all the characters will need to become friends. No “outsiders” allowed please (except for parents, of course, but they can’t comment.) Throughout the week, post and comment as though you were really that character. Though you don’t have a posting/commenting quota, your character needs to participate actively. Print out your Facebook pages to submit—no revision will be necessary of course. We've had a lot of fun with this one! We continue the project throughout the course of the novel. Then at the end, we have a springboard for talking about character development, plot development, dramatic irony, etc. #5. And what should we do in Illyria? Create a travel brochure that convinces me to visit some certain place in (your choice of literary work). Capture the setting, mood, and tone of the work so visitors understand what the place is like. Try to think of everything a traveler would want to know. Consider an attractive travel package. Be creative (even ironic?) and have fun! Here are a couple of student examples for this one, too. Notice that one student opted to discourage visitors--very clever! This is one of my favorite projects because of the focus on some more difficult concepts like tone and mood. Stop by next week for five more literature based project ideas! In the MOOD for Verbs? Regardless of how you feel about Common Core, teaching verb mood can be pretty challenging. These three steps can help your students learn these concepts—and they can be applied to teaching other concepts as well! The conditional mood is almost always used with the modals could, might, or would in an independent clause. If you wanted a detailed explanation of conditional mood, you would check out http://grammar.ccc.commnet.edu/grammar/conditional.htm. If you were to visit http://web.cn.edu/kwheeler/grammar_subjunctive.html, you would find more information about subjunctive mood (which occurs in a dependent clause). 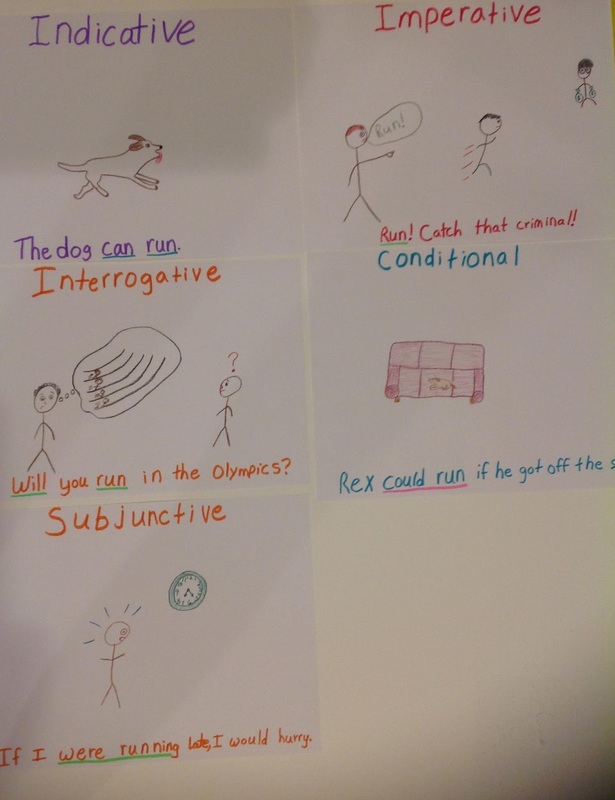 Here are examples of student-created mini-posters. Notice that the students underlined the verb in each sentence. Step Two: Collect examples. 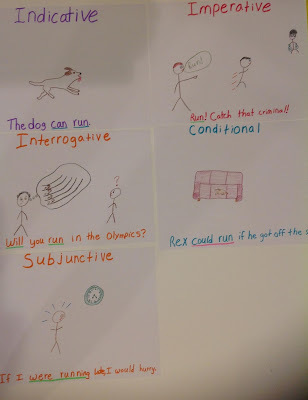 My students don’t generally have trouble with imperative, interrogative, and indicative, but the best way I have found to help them grasp subjunctive and conditional mood is to have them collect examples. Think of a bug collection—except with sentences as the specimens! Dedicate a bulletin board or space on your wall for the collection. When a student comes across an example of one of the moods you are studying, she writes it on a note card (along with a basic citation). When a student brings in an example, allow him to share it with the class and point out the verb form. Then post the card in the permanent collection. My classes have always enjoyed competing against each other—the first class to bring in twenty specimens gets some kind of reward, for example. With awareness of and regular exposure to the different moods, students can remember and use them correctly. Here is an example of a specimen card and one of the charts I use to keep up with how many examples each class has contributed. 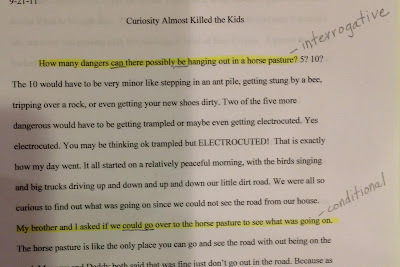 Annotating their own writing in this way encourages students to think critically about the writing and to understand the relevance of the concepts they are studying. Of course, students can identify other concepts you’re trying to reinforce as well. Here is a student example. Because of the annotation, you can see quickly and clearly that this student understands interrogative mood but doesn't quite grasp conditional mood yet. This type of assessment is much more meaningful than a multiple choice test. If you have your own classroom-tested strategies for teaching verb mood, I hope you’ll share them in the comments section below. We can all use a new idea now and then! Why have I mentioned these definitions? 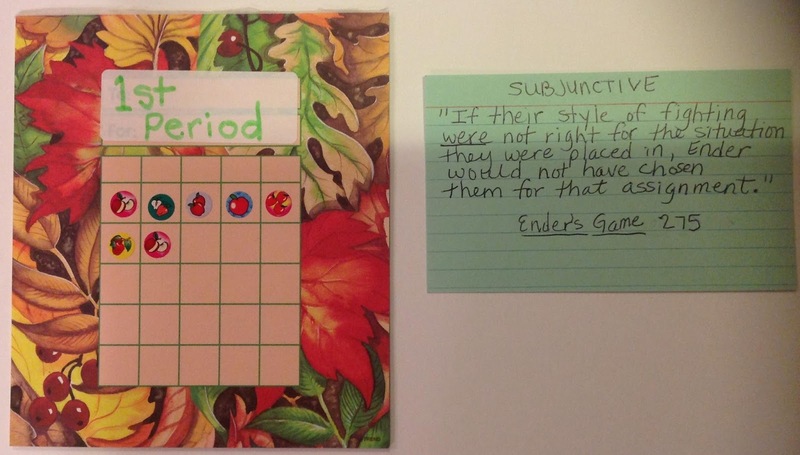 What does a key have to do with writing a summary? But the fact is that students do not know how to write summaries. We know this because when we ask them to summarize, they either give us one sentence or regurgitate the whole article back to us. Yet, we often assign summaries without really teaching students how to write them. So how then should we teach them? Below are the keys to writing good summaries. Key #1: Students need to know what you expect when you ask them to write a summary. Tell them, but also find as many well written summaries as you can and let students read them. You can find them on book jackets, in book and movie reviews, on the Internet, or possibly in your own students' writing portfolios. Read the summaries and discuss them. Key #2: Give students a short article or selection to read. All students should read the same selection. Discuss. Key #3: Working as a group, have students make a list of five or six important or key words in the article or selection. Explain that key words are the most important words in the selection. These words help the reader understand the selection; if the words were missing, the selection would not make sense. Key #4: Still working as a group, have students use the key words to write three or four sentences about the selection. Remind students that they should write the summary in their own words and should not copy sentences from the selection. Also, let them know that it is not always necessary to use all of their key words. Using the length of the article as a guide, you should specify the number of sentences that you want them to write. For a longer article or book, the number might be slightly higher. By giving students a limit, you are forcing them to be concise and focus their thoughts on the main idea of the selection. Key #5: Follow this procedure several times with different articles or books that the entire class has read. Then give the students opportunities to read articles, find key words, and write their own summaries. I have used these keys to teach students of all ages to write concise, thoughtful summaries. You will be surprised at the improvements you will see in your students’ summary writing over a short period of time just by following these five simple keys on a regular basis. Daily Reading Practice provides students with the opportunity to identify key words and write a summary each week. Visit http://www.dgppublishing.com/reading.htm to learn more!